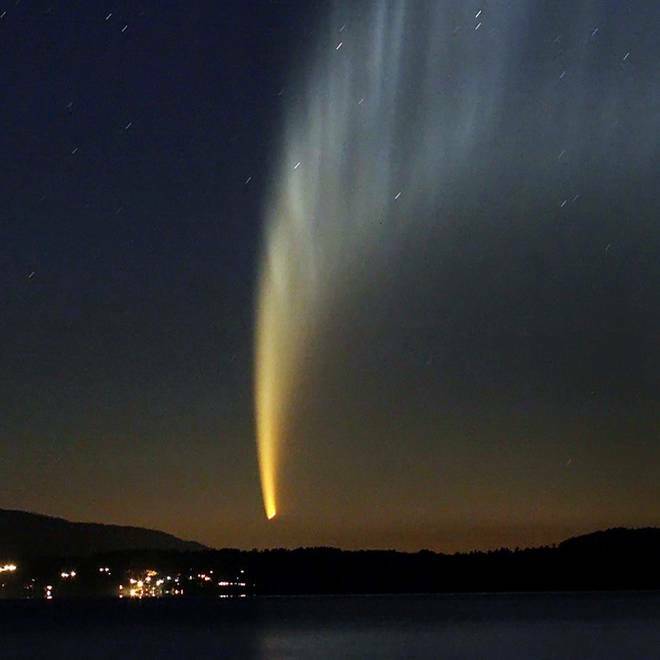 Comet McNaught shines above Chile in 2007. Will Comet ISON be as bright in 2013? Next year's most eagerly awaited shows in the skies above might not happen — but that's exactly what makes them so eagerly awaited. There's nothing like uncertainty to build up the drama, and right now, Comet PANSTARRS and Comet ISON are surrounded by bright haloes of uncertainty. The picture should be getting clearer in the weeks ahead for the comet formally known as C/2011 L4 PANSTARRS, which was discovered in 2011. It'll take a few more months to get a fix on C/2012 S1 ISON, which was first spotted this September. All we can say right now is, if the comets live up to their current high expectations, PANSTARRS could blaze as bright as Venus in March — and then, in November and December, ISON could outshine the moon to the "Comet of the Century." "If Comet ISON can survive perihelion passage ... then we are almost surely in for a striking display in the morning sky as Comet ISON recedes from the Sun next December," veteran observer John Bortle said this month on the Comets Mailing List. "Its immense tail, partly the result of our extremely favorable viewing circumstances in this case and just as with the Great Comet of 1680, could well result in a tail of amazing length and surface brightness, even if tipped by only tiny, relatively insignificant head." The best part is that these comets will be visible in the Northern Hemisphere, unlike the spectacles created by Comet McNaught in 2007 and by Comet Lovejoy a year ago. Why let the Southern Hemisphere have all the fun? Jan. 2-3 for Quadrantid meteors: If the weather's clear, the Quadrantid meteors should put on serviceable show this year. The Quadrantids are sparked by debris from asteroid 2003 EH1, and appear to emanate from an area of the sky known as Quadrans Muralis, around the northern tip of the constellation Bootes. The peak rate is expected to reach 80 meteors per hour, but the glare of a waning gibbous moon could interfere somewhat. "Unlike the more famous Perseid and Geminid meteor showers, the Quadrantids only last a few hours, so it's the morning of Jan. 3 or nothing," NASA says. Check out NASA's Quadrantids website for a video feed on the nights of Jan. 2-4. April 25 for partial lunar eclipse: Three eclipses of the moon are coming during 2013 — and although none of them will be spectacular, they're worth keeping an eye on if you're in the right place. The April 25 partial eclipse will be visible from Europe, Africa, Asia and the Pacific. The other two lunar eclipses are a nearly imperceptible hint of a penumbral eclipse on May 25, and a somewhat deeper penumbral eclipse on Oct. 18-19 (visible, at least in part, from the Americas, Europe, Africa and Asia). Even if you miss seeing these eclipses with your own eyes, there'll be plenty of photo galleries showing the moon in its best light. March for Comet PANSTARRS: The comet is due to streak past Earth on March 5 and make its turn around the sun, known as perihelion, on March 9-10. The prime time for observers at mid-northern latitudes will come after perihelion, when PANSTARRS will be visible in the evening sky. On March 12, the comet is expected to share the sunset's afterglow with a beautiful crescent moon. Clouds cast a pall over an annular solar eclipse as seen from Hirai Daini Elementary School in Tokyo on May 21, 2012. An annular eclipse is due to occur on May 10, 2013, and in November there'll be a hybrid eclipse that morphs from annularity to totality. 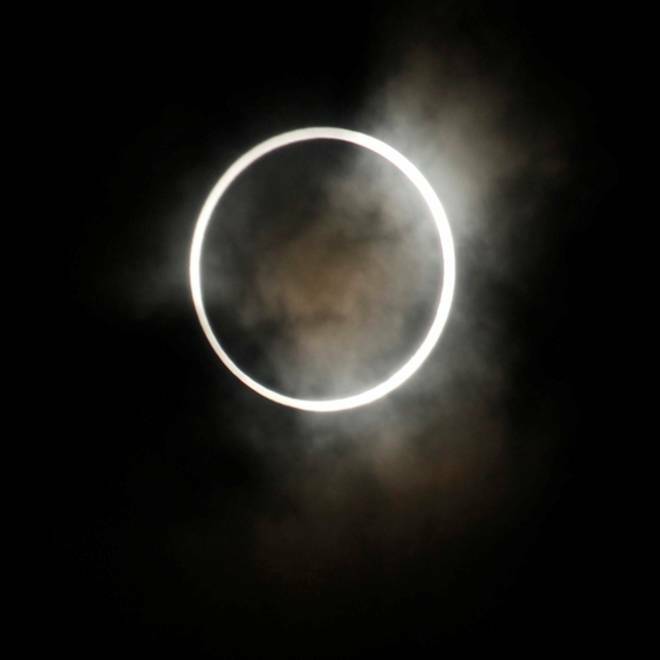 May 9-10 for annular solar eclipse: A "Ring of Fire" eclipse will roll across Australia, Papua New Guinea and the South Pacific, with a partial solar eclipse visible from a wider swath of the Pacific. If past history is any guide, some of us in North America will be watching the event unfold on the evening of the 9th, via webcasts from the scene. May 24-28 for planetary party: Mercury, Venus and Jupiter mix it up in western skies over a series of nights in May, with Saturn and the moon adding their shine. The main event may well be the Venus-Jupiter conjunction on May 28 — but it won't be as spectacular as the double-planet feature we saw in February, because this one will take place so soon after sunset. June 23 for Supermoon: The moon goes full just after this year's closest approach to Earth, meaning that it'll look 14 percent bigger and 30 percent brighter than it does at maximum distance. Last May's Supermoon made such a splash that I suspect this could turn into an annual moon-watching event. Aug. 11-13 for Perseid meteors: Annual meteor showers have their ups and downs, and the advance word is that 2013 will be an "up" year for the Perseids. The moon will be a mere crescent in the morning sky, cutting down on the glare. The flux of shooting stars is expected to be normal, peaking at around 100 meteors per hour. Oct. 12 for moon observation: International Observe the Moon Night provides an opportunity for veteran skywatchers to show you the moon at its best — no, not during the full moon, but during the first-quarter phase. That's when you can get a good look at the moon's craters and shadowy mountains. Check in with the InOMN website for updates. Nov. 3 for hybrid solar eclipse: This hybrid is a strange one, starting out as an annular "Ring of Fire" eclipse and turning into a total eclipse as the moon's shadow races across the planet. The track of annularity-totality runs across the Atlantic, goes through the middle of Africa and ends up in Somalia. If you can't afford a cruise or an expedition, keep a watch on the webcasts. Bonus round: Over at Space.com, Joe Rao's "13 must-see stargazing events for 2013" also include a close conjunction of the moon and Jupiter on Jan. 21, great evening views of Mercury from Feb. 2 to 23, and a holiday show featuring Venus in December. And don't forget the northern lights: Although auroral displays are hard to predict, the height of the sun's 11-year activity cycle should bring some great light shows to Earth's higher latitudes in 2013. Update for 8:50 p.m. ET: British educator-astronomer Stuart Atkinson has set up a blog titled "Waiting for ISON" to monitor the comet countdown. Atkinson is also in charge of "The Road to Endeavour" blog about the Opportunity rover on Mars; and The Gale Gazette, which keeps tabs on NASA's Mars Curiosity mission.